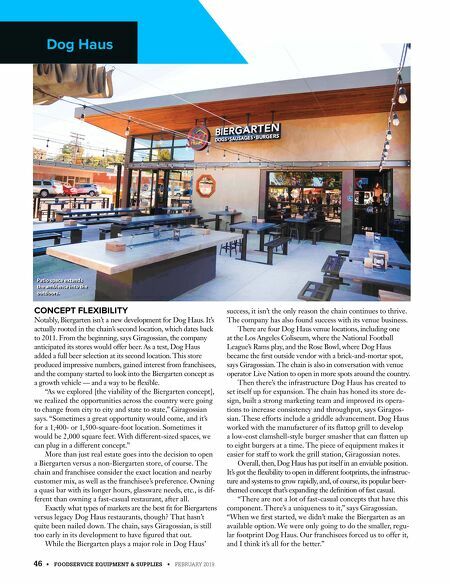 46 • FOODSERVICE EQUIPMENT & SUPPLIES • FEBRUARY 2019 CONCEPT FLEXIBILITY Notably, Biergarten isn't a new development for Dog Haus. It's actually rooted in the chain's second location, which dates back to 2011. From the beginning, says Giragossian, the company anticipated its stores would offer beer. As a test, Dog Haus added a full beer selection at its second location. This store produced impressive numbers, gained interest from franchisees, and the company started to look into the Biergarten concept as a growth vehicle — and a way to be flexible. "As we explored [the viability of the Biergarten concept], we realized the opportunities across the country were going to change from city to city and state to state," Giragossian says. "Sometimes a great opportunity would come, and it's for a 1,400- or 1,500-square-foot location. Sometimes it would be 2,000 square feet. With different-sized spaces, we can plug in a different concept." More than just real estate goes into the decision to open a Biergarten versus a non-Biergarten store, of course. The chain and franchisee consider the exact location and nearby customer mix, as well as the franchisee's preference. Owning a quasi bar with its longer hours, glassware needs, etc., is dif- ferent than owning a fast-casual restaurant, after all. Exactly what types of markets are the best fit for Biergartens versus legacy Dog Haus restaurants, though? That hasn't quite been nailed down. The chain, says Giragossian, is still too early in its development to have figured that out. While the Biergarten plays a major role in Dog Haus' success, it isn't the only reason the chain continues to thrive. The company has also found success with its venue business. There are four Dog Haus venue locations, including one at the Los Angeles Coliseum, where the National Football League's Rams play, and the Rose Bowl, where Dog Haus became the first outside vendor with a brick-and-mortar spot, says Giragossian. The chain is also in conversation with venue operator Live Nation to open in more spots around the country. Then there's the infrastructure Dog Haus has created to set itself up for expansion. The chain has honed its store de- sign, built a strong marketing team and improved its opera- tions to increase consistency and throughput, says Giragos- sian. 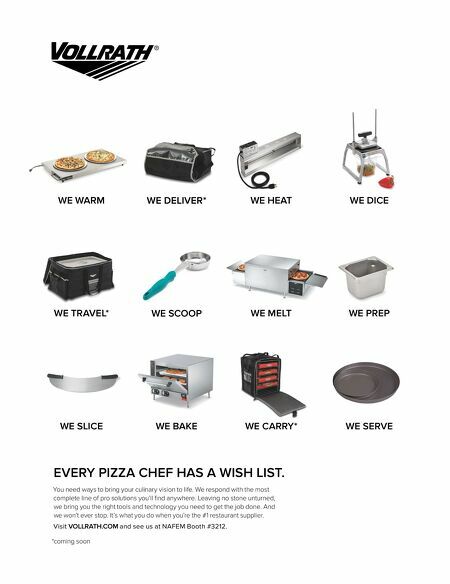 These efforts include a griddle advancement. Dog Haus worked with the manufacturer of its flattop grill to develop a low-cost clamshell-style burger smasher that can flatten up to eight burgers at a time. The piece of equipment makes it easier for staff to work the grill station, Giragossian notes. Overall, then, Dog Haus has put itself in an enviable position. It's got the flexibility to open in different footprints, the infrastruc- ture and systems to grow rapidly, and, of course, its popular beer- themed concept that's expanding the definition of fast casual. "There are not a lot of fast-casual concepts that have this component. There's a uniqueness to it," says Giragossian. "When we first started, we didn't make the Biergarten as an available option. We were only going to do the smaller, regu- lar footprint Dog Haus. Our franchisees forced us to offer it, and I think it's all for the better." Dog Haus Patio space extends the ambience into the outdoors.